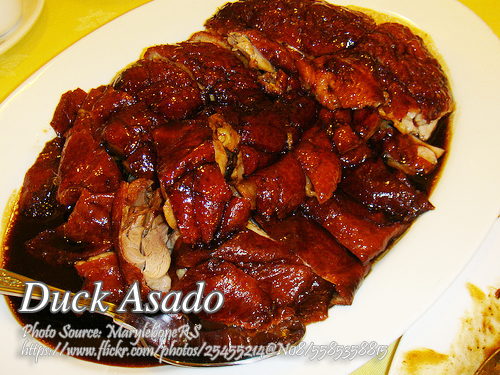 A delicious and easy to cook native duck asado or asadong itik. In fact you can cook it on any occasions specially if you love duck meat. Compared to chicken meat, duck meat are darker and more tasty but it has a gamey flavor and smell. But with the right spices and ingredients you can get rid of it and have a more delicious and satisfying meal. To cook duck asado; Marinate duck in beer, Sprite, sugar, vinegar, soy sauce, garlic, oregano leaves and peppercorn overnight. Heat olive oil in deep saucepan and fry duck until golden brown. Drain in absorbent paper towel. In a deep saucepan, bring to a boil the fried pieces in the marinade liquid and water. Simmer until tender and sauce thickens. Serve and garnish with fresh orange wedges and olives on the side, as desired. Marinate duck in beer, Sprite, sugar, vinegar, soy sauce, garlic, oregano leaves and peppercorn overnight. Heat olive oil in deep saucepan and fry duck until golden brown. Drain in absorbent paper towel. In a deep saucepan, bring to a boil the fried pieces in the marinade liquid and water. Simmer until tender and sauce thickens. Serve and garnish with fresh orange wedges and olives on the side, as desired. Serves 4.